Take a look at the 30 most popular copper kitchen accessories and you’ll be excited to add some of these to your kitchen. Whether you want new utensils or copper bakeware, you’ll find all the best here. And these make great gifts too. Personally, I love what a touch of copper can do for a kitchen. You get elegance and luxury without a big price tag. If you don’t already have any copper color, I’d start with 3 pieces and then keep going from there. Of course, it depends on the size of your kitchen. If you have a large kitchen you’ll need to start with more items to really get the effect. But for a small kitchen start with 3 copper kitchen items. Start with your favorites or choose things you really need straight away like a dish drainer, a utensil caddy or a new cake pan. There are a couple of different approaches to decorating your kitchen with copper. You can keep it all high-end and buy solid hammered copper items. Alternatively, if you want to spend less you can get copper plated or copper color products. As much as I love the solid copper pieces, I’m happy to buy the others too. At first I loved the idea of only getting solid copper things for my home but it really limited my choices and my budget! If you see something in a style you like, I’d get it, whether it’s solid, plated or just the color. That’s my philosophy. As long as the items all look good together in your kitchen decor, go with your own instincts and buy what you like. 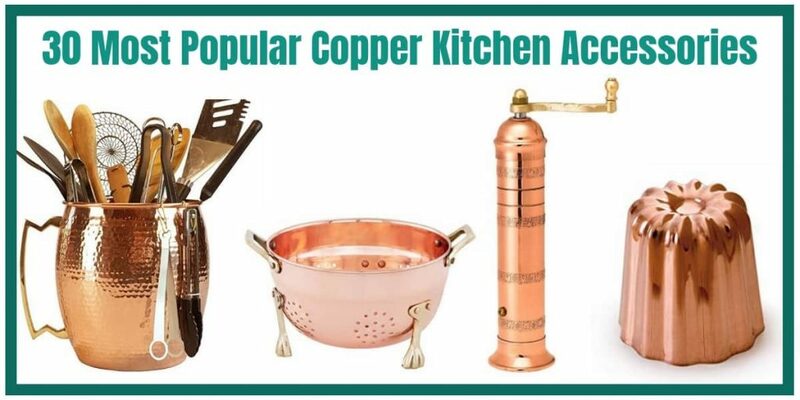 Now, for the most popular copper kitchen accessories…let’s take a look.